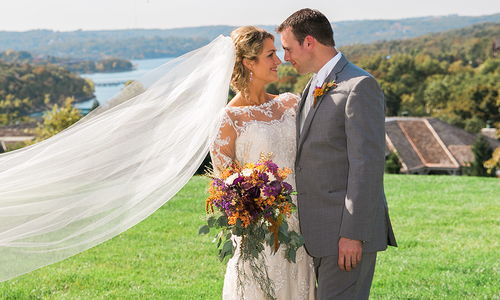 Mariah and Christopher were married at Top of the Rock, which offered plenty of great spots to snap photos. 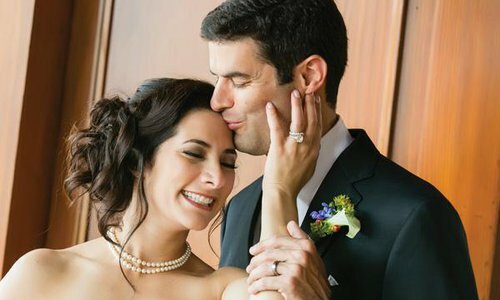 Mariah Allai and Christopher Joshi met while they were both working in Columbia at University Hospital, connected to the University of Missouri. Mariah was working as a CT technologist, and Chris was in his last year of residency at the hospital. Each of them worked long hours, and Chris spotted her during his shifts. Chris asked Mariah out on a date, and to impress her, he took her to her favorite restaurant in Columbia: Sophia’s. Several dinners and a year later, Chris and Mariah were on vacation in Naples, Florida. Chris surprised Mariah with a private session at the city’s zoo with her favorite animals, giraffes, and then he started acting really strangely, she says. Chris had planned to propose to her that night at a dinner he had arranged on the beach, but he just couldn’t wait to ask her. 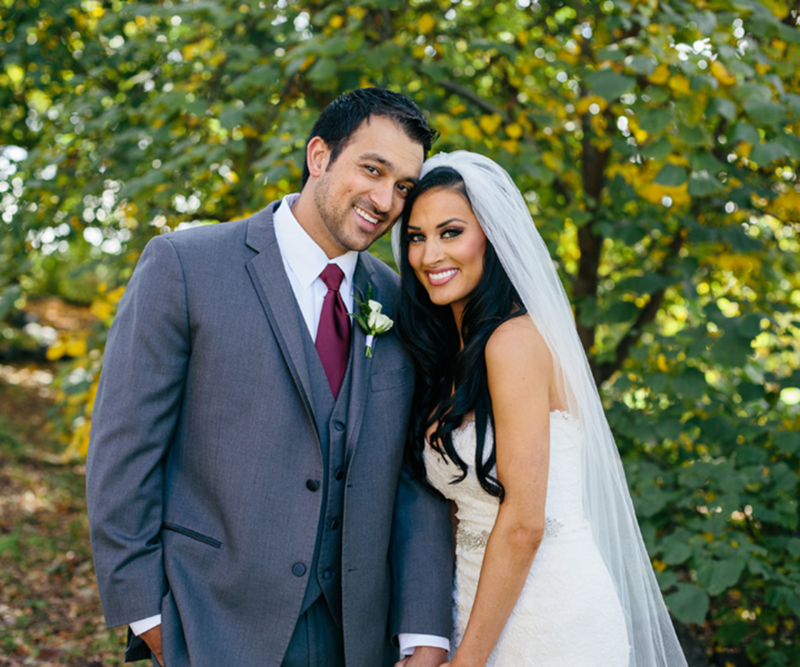 The couple was married October 17 at Top of the Rock in Ridgedale. 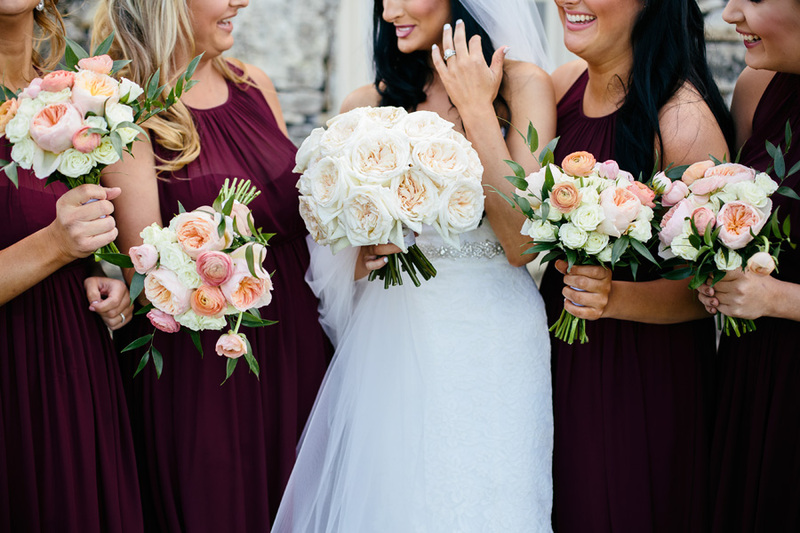 The fall wedding ceremony was romantic and classic with deep maroon and champagne details throughout. 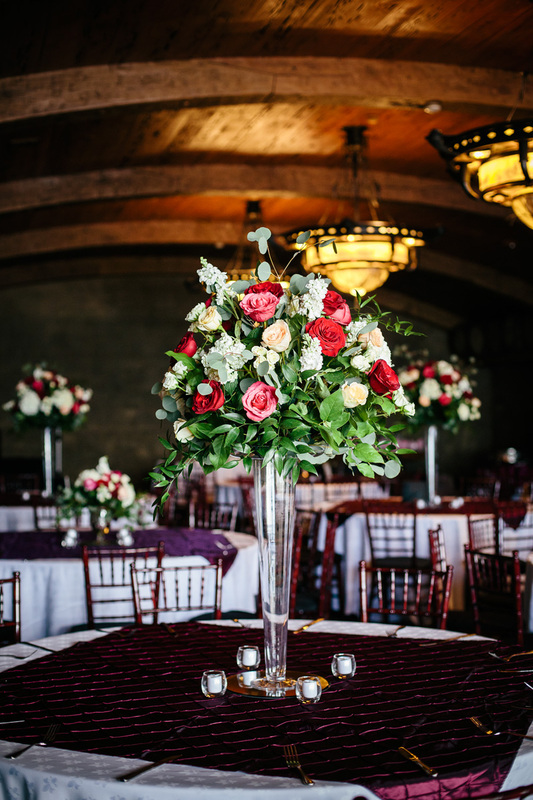 Cool colors and sparkling accents echoed at the reception, located in the heart of the Top of the Rock Wine Cellar. 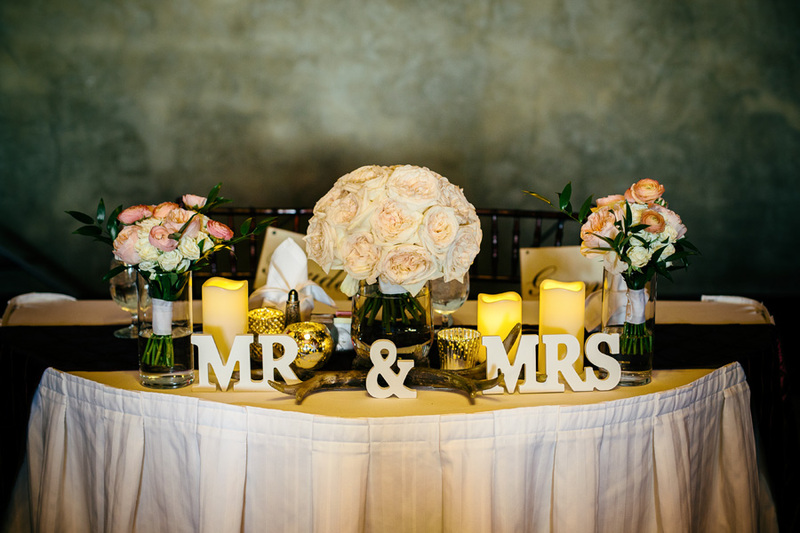 Candlelight and soft white florals warmed the space, and the frosted base of the classic white cake matched the bride’s ivory rose bouquet. 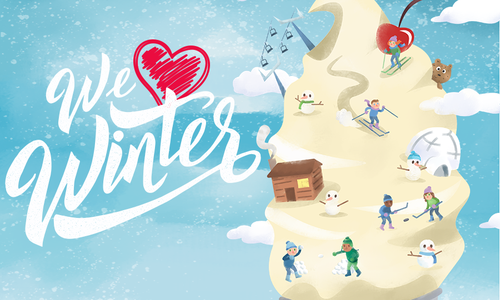 Now, Mariah and Chris work together at a different hospital: Cox Medical Center South. As a gift to her best friends, Mariah treated each bridesmaid to a robe and a bottle of champagne during the pre-wedding festivities. 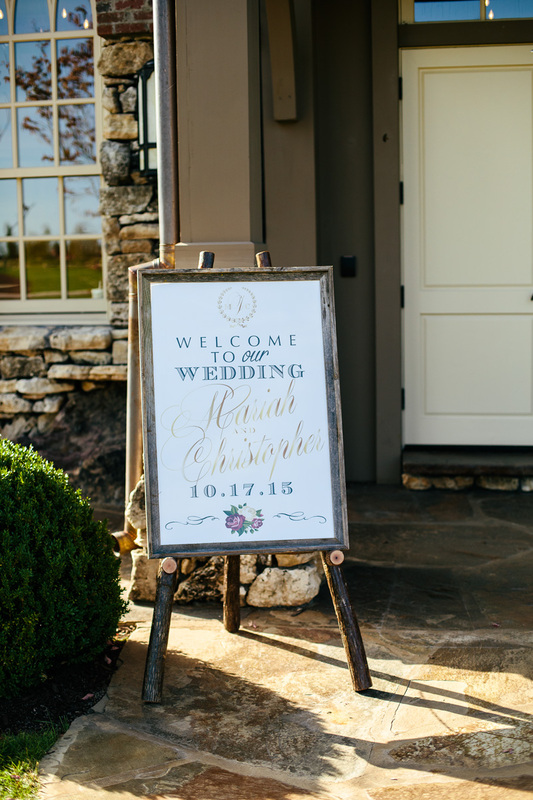 A custom sign welcomed guests to the gorgeous fall wedding at Top of the Rock. He Loves Me Flowers by Charity Bennitt brought beauty and a touch of fresh elegance to the reception. 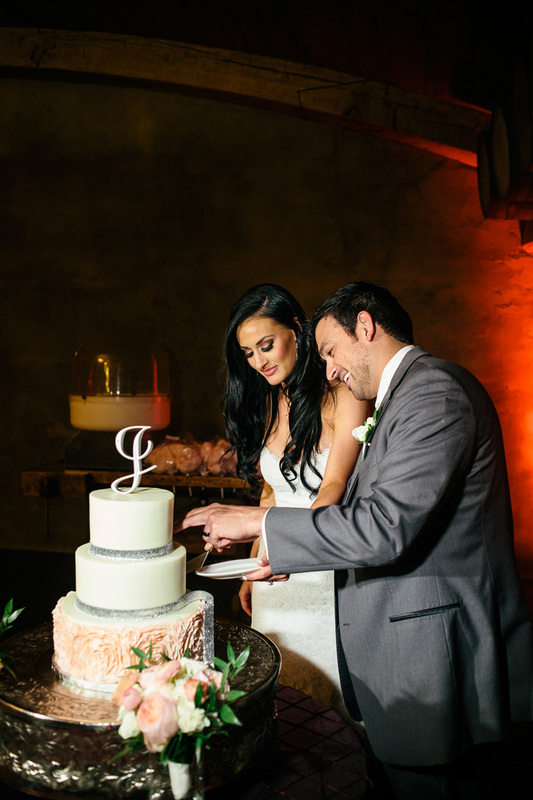 To warm up the Top of the Rock Wine Cellar, the bride chose white linens and candlelight for a soft, romantic setting. Glittering gold votives sparkled and shined during the reception. 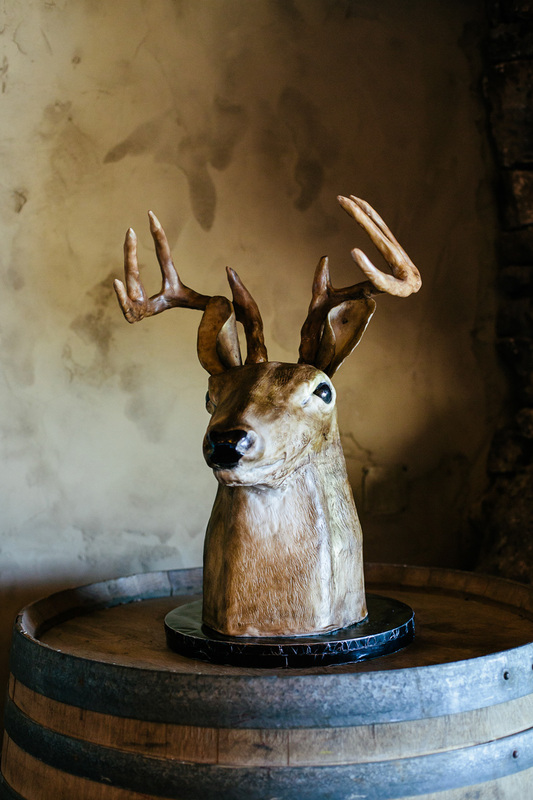 The bride and groom hunted for the perfect groom's cake, which was a Sugar Leaf creation in the shape of a buck as a nod to Christopher's love of hunting. 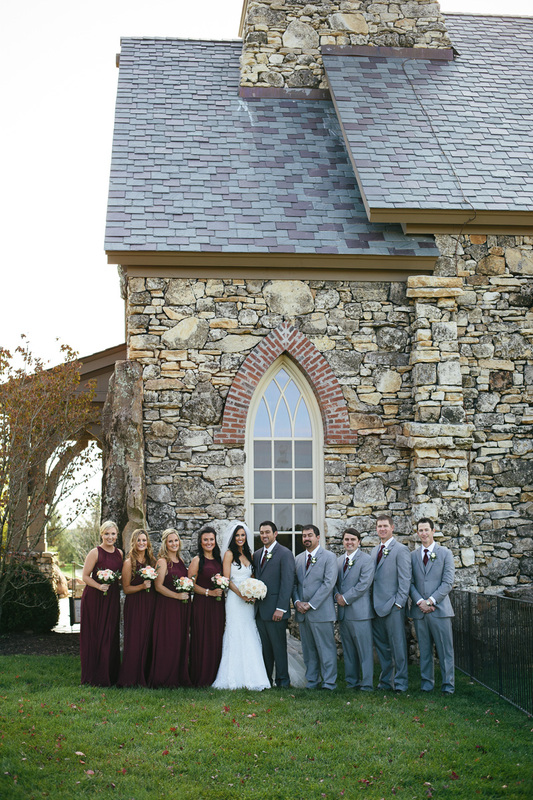 Bridesmaids wore maroon floor-length gowns from Normans Bridal. The groom and his groomsmen wore gray suits from Men’s Wearhouse. 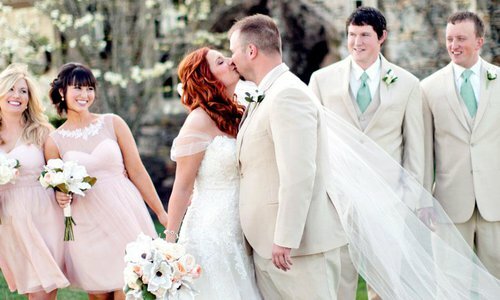 The bride wore a lace trumpet dress with a sparkling belt. 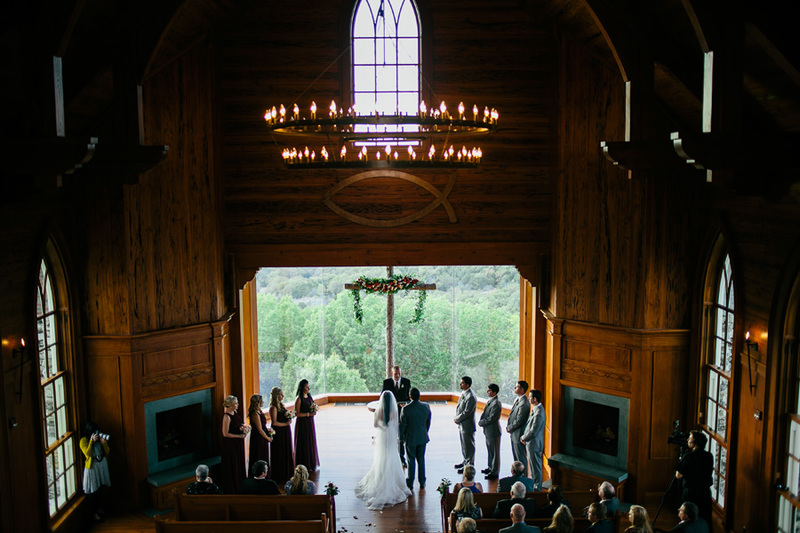 Oversized windows provided a jaw-dropping backdrop for the ceremony. A bit modern and a bit traditional, the cake featured classic white tiers, a metallic ribbon and topper and a tier matching the bride’s bouquet. But guests were in for a surprise: the cake’s flavor was cotton candy. 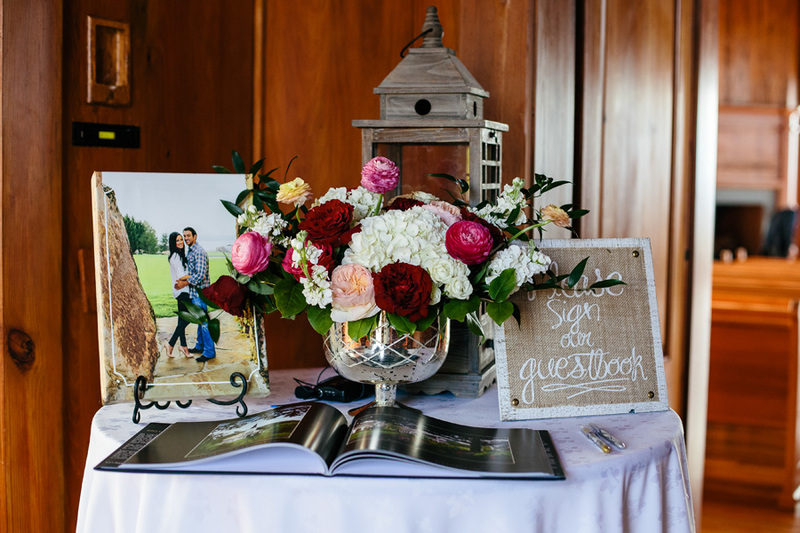 Outside the Top of the Rock chapel’s doors, guests were welcomed with romantic blooms, one of the bride's favorite engagement photos and an invitation to sign the couple’s photo guestbook. He Loves Me Flowers by Charity Bennitt created gorgeous bouquets for the wedding, including an ivory rose bouquet for the bride and bouquets with pops of peach and pink for the bridesmaids. 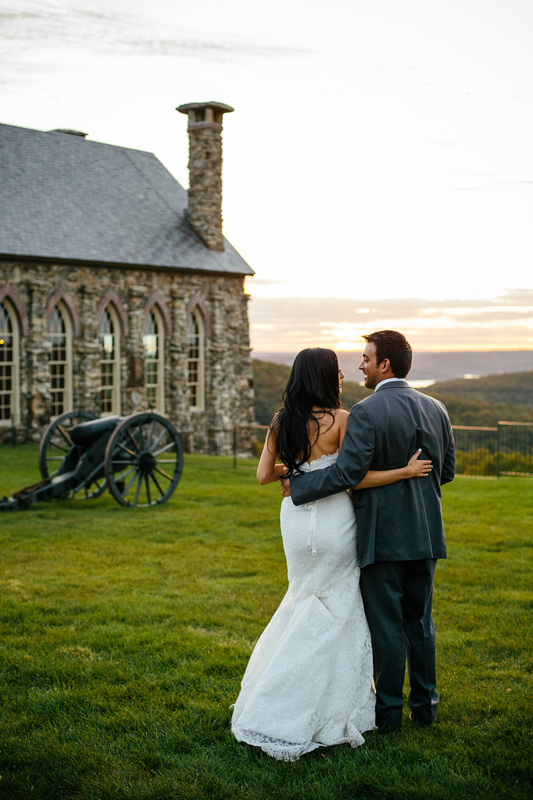 The couple celebrated their first sunset as husband and wife by the stone chapel.